SAIC Motor Corp, China's largest automaker by sales, said yesterday it expects a more than nine-fold rise in 2009 net profit on the back of a remarkable sales jump. In a filing with the Shanghai Stock Exchange, Shanghai-based SAIC said its vehicle sales increased 57 percent to 2.72 million units last year, and it produced 2.76 million units during the same time, up 62 percent year-on-year. It expects its earnings per share for 2009 to reach 1 yuan (15 cents), 10 times greater than 0.1 yuan in 2008. "The sound performance is mainly the result of two factors, one is government incentives to buy cars, including a 5 percent cut in the sales tax on low-emission vehicles. The other is increased profitability from rolling out new products," SAIC said in the statement. SAIC, which operates joint ventures with General Motors Co and Volkswagen AG, reported a net profit of 656 million yuan ($96.08 million) in 2008. However, the profit growth forecast failed to win market sentiment yesterday, and shares of SAIC sank 1.6 percent to close at 25.24 yuan. "This was because the market had already digested the improved performance news beforehand," said Yang Huachao, an industrial analyst with Everbright Securities. Shares of SAIC jumped more than three times last year. Amid a government-led recovery, China's auto market saw robust growth in 2009. In the first 11 months of last year, a total of 9.23 million passenger cars were sold, up 49.70 percent from a year earlier. 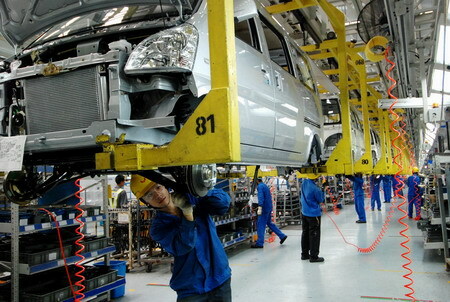 According to Yang, China will continue to boast robust vehicle consumption in 2010. "There are about 850 cars per 1,000 people in the US, while we have about 35 to 40 cars per 1,000 people in China. This means there is enormous growth potential," Yang said. Diversified income-creating outlets like the stock and housing markets have strengthened Chinese consumers' spending power. As a result, the auto market will continue to be a bright spot in the world auto market, Yang added. As China's leading automaker, SAIC revealed a less than ambitious plan in the report, saying it plans to sell 3 million cars in 2010, up 10.29 percent from 2009. But SAIC's modest plan couldn't hide its desire to become a bigger player on the world stage. In December, SAIC announced it would jointly develop vehicles for India's car market with GM. GM already controls a 3.3 percent share of India's market, a relatively low percentage in comparison with its presence in major markets across the world. India is the fastest growing auto market after China, with annual demand estimated at 2 million low-end vehicles. SAIC is scheduled to publish its 2009 earnings report on April 2. Compared with white-collar workers, elderly players have more time on their hands for online games. Johnny Depp at the 2010 People's Choice Awards in L.A.
Actress Sandra Bullock poses with her favorite movie actress award at the 2010 People's Choice Awards in Los Angeles January 6, 2010. News that the wife of Yao Ming, the Houston Rockets' All-Star center, is pregnant has sent netizens rushing to predict Baby Yao's height and gender in the hopes that the child will someday lead the national basketball team.